Monster head resembling a treasure chest. exiled for the sin of avarice. wearer with the curse of the branded. Rare drop from Mimic. 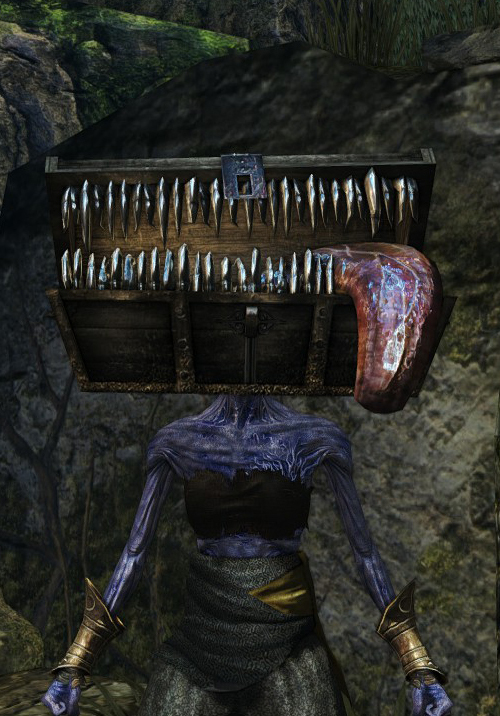 Check the Mimic's page for farming tips. Also, if every available Mimic is killed in one playthrough, the last one defeated will always drop it. Drains health at the rate of 5 HP/Second. The health drain continues even when resting at bonfire. If you want to peruse your spells or items at a bonfire, remember to take it off or it will kill you right at the bonfire. Due to its regular health drain, this item is a good choice for safely reaching the required health for using the Red Tearstone Ring. Adds +200 to Item Discovery and increases soul drop by 20%. There's a time gap between the death of a boss and its soul drop. You can equip this helmet and/or Covetous Silver Serpent Ring in this time frame, and you will still get extra souls. The time frame is quite long; you can fully view a boss' death animation and still have time to switch gears. The size of the chest makes it very hard to aim with a bow when it is equipped, though if you use the Ring of Fog it is easy to aim a bow by seeing through the chest.